Award-winning author and physician Deborah Shlian, whose latest medical mystery thriller, “Silent Survivor,” was released earlier this month in Paperback and on Kindle, will speak at the Institute for Learning in Retirement on July 25th at 11:15am. Deborah will be participating in the MOB’s Day Before Halloween Party. A short talk and signing. Food and drink! Wear a costume if you like! 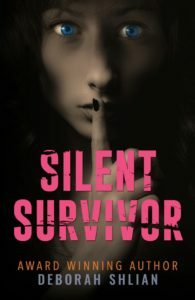 Deborah Shlian will talk about and sign her new medical mystery/thriller “Silent Survivor” along with Joan Cochran who will talk about and sign her new mystery “The Yiddish Gangster’s Daughter”. Both books have strong female protagonists. There will be snacks and drink along with lively discussion. Physician and author Deborah Shlian, whose latest mystery thriller, “Silent Survivor,” was released in 2018, will come to the Friends of the Spanish River library meeting to talk about her book, writing medical mystery thrillers, and more.